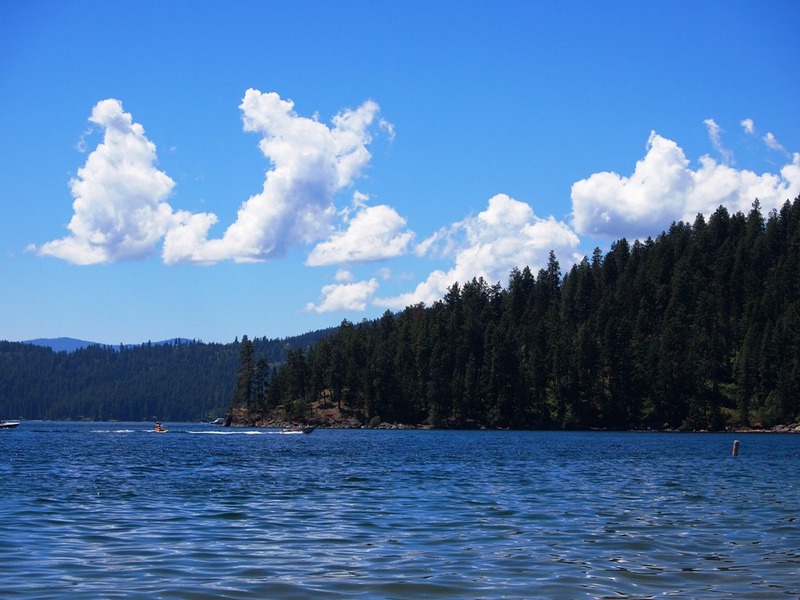 Door-to-shore, thirty-two miles east of our house, is Lake Coeur D’Alene. A comparable distance to our go-to beaches in Southern California, Newport Beach or Salt Creek Beach. Spokane, in addition to the Spokane River, is centrally located to 20 some odd lakes. Where do newbies like us go to cool off in this heat wave? As SoCal transplants, we are programmed to think about parking and crowds. Our summer plan is to visit as many of the lakes as possible to figure out which one suits us best. We decided to start with Lake Coeur D’Alene. Beaches stretch the California coastline, lake beaches don’t always exist, or aren’t accessible without a boat. If you ask a local, they tell you to just grab a chair and claim a spot. But where? We packed our chairs, towels, sunblock and feedbags, loaded into the car and headed east to the lake to find our spot. We didn’t leave the house until 11:30, being programmed as we are, we thought we would be hard-pressed to find a beach, let alone a spot to call our own. We seriously need to deprogram. By following Lakeshore Drive, we easily found a few public beaches scattered between spectacular houses with private beaches. We opted for Jewett House Public Beach and staked our claim on the rocky beach. Jewett House is a city owned 1900’s home, right on the lake, that is available to rent for events. We parked less than a block away, for free. Though the beach had plenty of people, we easily found a spot at the water’s edge. The boys were bemoaning the fact that they didn’t have their boogie boards. Apparently they missed the lesson on lakes to learn that lakes only have boat wake waves, no waves like the ocean. Their reaction was priceless. They had no idea what they were supposed to do at the lake. Understanding that the lake was fresh water, not chlorinated or saltwater, boggled their minds as well. Vince is a SoCal boy and knows the ocean well. Me, I was raised going to Nickelplate Beach in Huron, Ohio on Lake Erie. I also spent some of my summers at my aunt and uncle’s lake house on Bass Lake near Baldwin, Michigan. It was the 70’s so “freshwater” in Lake Erie at that time is debatable but I know lakes. 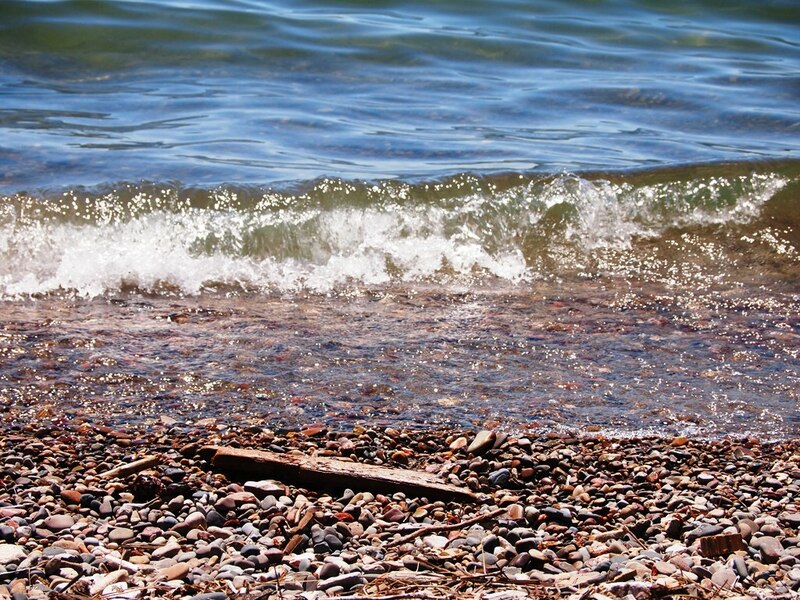 The sun was crispy hot, the water at Lake Coeur D’Alene was clear and cold, but tolerable. Some locals told us they don’t bother getting in the water until late July or August when it warms up. Our kids stayed in the lake all day. They quickly learned that in a lake, you toss a football, play monkey in the middle, swim to the buoy and back, skip stones and just cool off. Who needs a boogie board? It turned out that I was the one at a loss what to do. My normal beach routine is to read, swim, flip, read, swim, flip to perfect my rotisserie tan. In all the morning hoopla, I forgot to pack my book. Dummy!! I haven’t read a book cover to cover in weeks. Weeks! I survived our beach day by jumping in the lake. Vince swam to the buoy a few times and managed to take a nap. Our only issue was that our spray on sunblock, that everyone used was expired. The sun was intense and we fried…except in the spots where we later applied the suntan lotion. We are all a striped mess. Our first lake beach trip was a success, but we all agreed on one thing, we need a boat.